A fast-paced game of fiendish Martians, big top heroes, and scifi movie action. Flying Frog continue their run of heavily themed, fun and cinematic games featuring photographic illustrations with Invasion From Outer Space. Yes, it’s just Last Night on Earth with Martians and circus performers instead of zombies and townsfolk, but it’s still a good laugh and well worth your gaming dollars. Creepy little Martians—complete with clear plastic helmets—invade a 1940s circus, and the motley crew of circus performers are the first line of defence for planet Earth. There are definitely some Tim Burton fans at Flying Frog, because the Martians are very reminiscent of the ones in his film Mars Attacks. 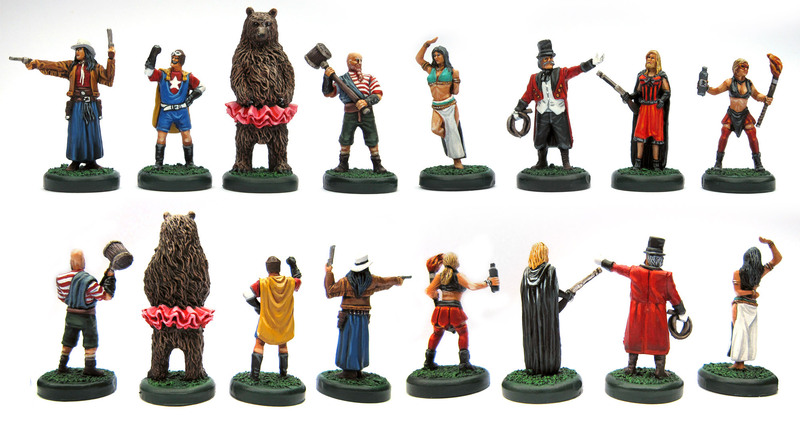 The circus performers—in Flying Frog style, played by actors—include Angelica the Bearded Woman; Lucrezia the Contortionist; Cassidy the Trickshooter; R. J. Flannigan, Ringmaster; Carl the Strongman; Archibald the Human Cannonball, Hannah the Firebreather, and finally Jo Jo the Dancing Bear. Arrayed against them are eighteen Martian Soldiers, a Martian Champion, and the huge and intimidating Zard Beast. 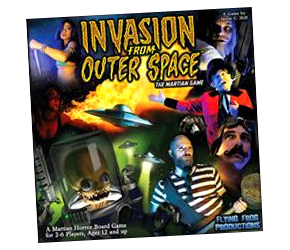 You can play the basic Invasion scenario to get started, then try out Abduction, where the Martians try and kidnap human allies from the various circus buildings; “Wipe Them Out!”, where Martians attempt to obliterate four groups of the crowds that are running screaming about the fairground; “Blow ’Em Out of the Sky!”, where the humans must destroy three flying saucers with the cannons placed around the board; and Unleashed, where a flying saucer has crashed and a Super Zard Beast is running riot! Invasion From Outer Space features some new mechanics—the Martian player has several options on his turn, from receiving reinforcements to building new tech Like the Death Ray—and there are also additional rules for fires and crowds. Cleverly, there are also comprehensive rules for combining this game and Last Night on Earth, so you can also play games of Zombies at the Carnival and Martians in the Small Town—or just mix and match the bits you like—if you own both games. Thank you kindly for the Rules Summary & Reference. Of the many solid Flying Frog games, Invasion from Outer Space is my personal favorite. Yes, IfOS is essentially a Last Night on Earth modification – but I find the Freaks vs. Martians theme a riot. Plus, playing as the martians is a much more strategic option than that of the zombies. Indeed, good point—more fun for the person playing the ‘baddies’, definitely.